We will learn how to find the equation of y-axis and equation of a line parallel to y-axis. Let AB be a straight line parallel to y-axis at a distance a units from it. Then, clearly, all points on the line AB have the same abscissa a. Thus, AB can be considered as the locus of a point at a distance a from y-axis and all points on the line AB satisfy the condition x = a. Thus, if P(x, y) is any point on AB, then x = a. Hence, the equation of a straight line parallel to y-axis at a distance a from it is x = a. 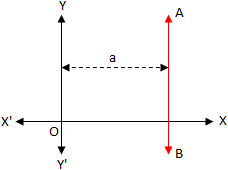 The equation of y-axis is x = 0, since, y-axis is a parallel to itself at a distance 0 from it. Let P (x, y) be any point on the y-axis. Then clearly, for all position of P we shall the same abscissa 0 or, x = 0. Therefore, the equation of y-axis is x = 0. If a straight line is parallel and to the left of x-axis at a distance a, then its equation is x = -a. 1. Find the equation of a straight line parallel to y-axis at a distance of 3 units on the left hand side of y-axis. We know that the equation of a straight line is parallel and to the left of x-axis at a distance a, then its equation is x = -a. 2. Find the equation of a straight line parallel to y-axis at a distance of 20 units on the right hand side of y-axis. We know that the equation of a straight line is parallel and to the right of x-axis at a distance a, then its equation is x = a.